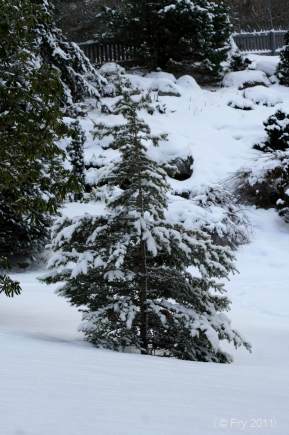 Cedar of Lebanon – A Winter Beauty! 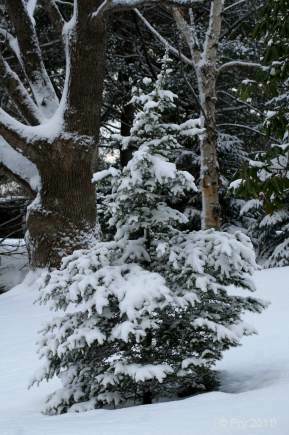 This little guy looks great with branches laden in fresh snow! Cedar of Lebanon – A Funky Feature! Cedar of Lebanon is another Funky Feature in the Historic Gardens. Featured on the flag of Lebanon, this cedar has a long and interesting history. There are numerous biblical references to the Cedar of Lebanon, now a christian symbol representative of Christ and associated with eternal life. The Arnold Arboretum, a great resource for anything related to trees, has a great article on the “The Quest for the Hardy Cedar-of-Lebanon“. A couple other good references are found at Blue Planet Biomes , Berkeley and Kew Gardens. Our Cedar of Lebanon, located on the lawn above the Lower Ponds, is still a small tree, but we can look forward to great things to come!